The Prisoner of Chillon is a 392-line narrative poem by Lord Byron. Written in 1816, it chronicles the imprisonment of a Genevois monk, François Bonivard, from 1532 to 1536. On 22 June 1816, Lord Byron and his contemporary and friend Percy Bysshe Shelley were sailing on Lake Geneva (referred to as "Lac Leman", the French name, throughout the poem) and stopped to visit the Château de Chillon. After touring the castle (and walking through the dungeon in which Bonivard was imprisoned), Byron was inspired by Bonivard's story and composed The Sonnet of Chillon. 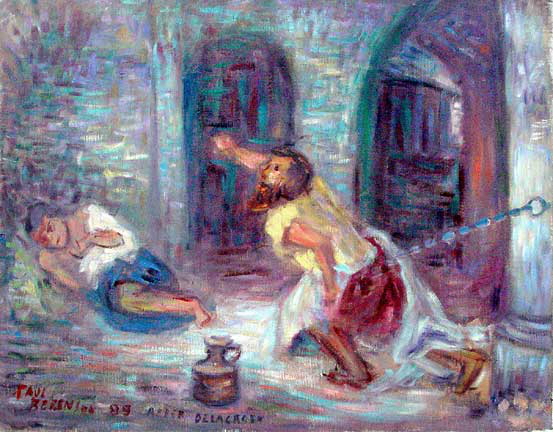 I painted this after the painting by Eugene Delacroix. PaulB's Pointillistic/Impressionist original oil paintings of Eugene Delacroix and various prints and poster formats of a wide variety of subject matter by the Pointillistic/Impressionist oil painter from landscape/waterscape paintings, dance, sports, portrait, to classical figures, flowers, rock and roll, Brazil, and Eugene Delacroix paintings and prints are available for purchase for as little as $24.95 for an 8" x 10" matted print on photo pape. Pointillistic/Impressionist Giclee prints of Eugene Delacroix on real canvas or heavy watercolor paper are available. One of a kind Eugene Delacroix embellished prints, which are Giclee prints retouched in genuine oil paint by PaulB. Unless noted PaulB's original Pointillistic/Impressionist oil paintiings are oil on canvas. Paul Berenson's pointillistic/Impressionist oil paintings are in privale collections around the world, including the downtown Los Angeles Athletic Club and have appeared in numerous publications, including the New York Philharmonic Playbill. PaulB.com also builds websites and PaulB is a member of the LA Web Professionals Group.